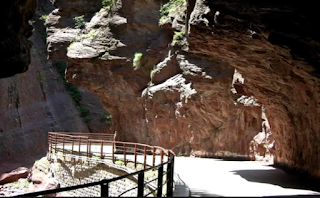 This🌞 morning 🌞 we left The Municipal Grand Canyon Campsite and set off on another Gorge-ous adventure - this time into the depths of the red Daluis Gorge! We set off along the D952 which followed the River Verdon for several miles towards the pretty village of Castellane, and as we went the bright autumnal colours seemed to dazzle us in today's lovely sunshine. 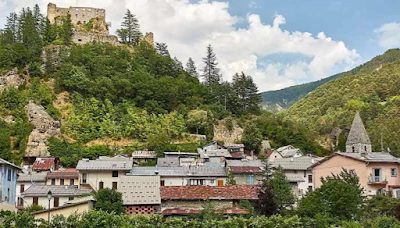 While we were in Castellane we stopped at their Casino supermarket to pick up a few bit and bobs (milk and 🍷) and then we headed out of the town past another huge hydro-electric dam that held aback the waters of the Lake St Julien de Verdon. From there we took the N202 and then the D2202 which eventually led us through a big hole bored right through solid rock and into the incredible Daluis Gorge which is a deep 6 km long meandering rift that has been carved out by the River Var. We journeyed along this road from South to North admiring the truly amazing red rock sculptures that the river has left behind, but travelling in either direction would have provided an adrenaline pumping white knuckle ride along another balcony road that clung to the sheer cliff sides. 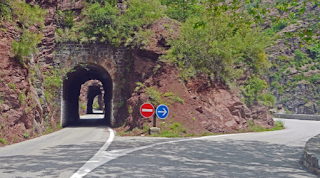 Some parts of the road were just one way - we went around the outside on the overhanging cliff edge and traffic from the other direction went through narrow tunnels! In places the road also became very restricted as it twisted under overhanging cornices of rock that looked as if they needed supporting, or as it passed by sheer drops that left no room for error! At these points all we could do was pray that nothing big was coming towards us - and thankfully, our luck held out! Eventually the roller coaster road kicked us out into the the ancient settlement of Guillaumes which can trace it's history back to the 10th century. 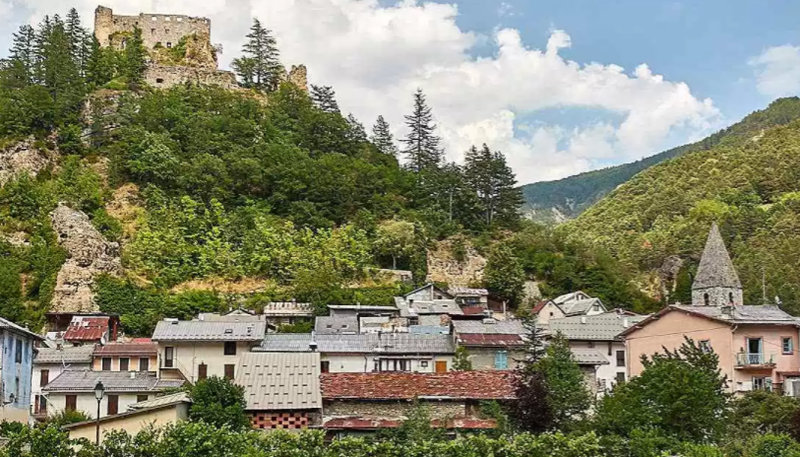 We soon settled into their free Aire, and then after lunch we had a stroll out and were able to admire the bells and flowers in the centre of the village as well as the ruins of the chateau that are perched on a rocky outcrop overlooking it! This village was also very conveniently situated for us because it lies at the bottom of the Cayolle Pass - another Col which we plan to tackle on our bikes tomorrow! However, as the summit lies nearly 22 miles away and over 3000 feet above us it's debatable if we'll get to the top - but I'm sure we'll enjoy trying! Well, as suggested previously, we didn't make it to the top which sits at 2326 metres above sea level! Part of the problem was we'd had 7 miles to cycle before we even started climbing the Col de la Cayolle, and with hindsight it would have been better if we'd moved T4rdis2 nearer to the base of the climb. However, we were unsure if we'd have been able to find anywhere to park safely, and as our ship was already ensconced in a safe and pretty spot we decided against that idea! Both we and our 🚴 batteries ran out of steam about 4 miles from the summit of the Cayolle but that was after we'd enjoyed the initial gently sloping tree clad inclines and magnificent far reaching views back down the valley. It was also up here, just after the settlement of Estenc, that we passed what we thought was the source of the River Var - I'm not certain but I'd like to think it was the waterfall on the right! and gurgling water that was flowing by in a little stream! However, by the time we got back to T4rdis2 our bike batteries were almost completely flat, so as our initial plan was to use them again tomorrow we set T4rdis2's navigation system to nip us up the 10 miles of the Col de Valberg where we knew there was an Aire with Electric. We landed right on the top of the hill in a purpose built spot that would charge us 10 euros for the pleasure of being there - but it really was a pleasure because from our van windows we had fantastic views of the valley sides that were littered with chalets and forested areas! A Pic borrowed from Google! But then once we were settled we had a big decision to make! 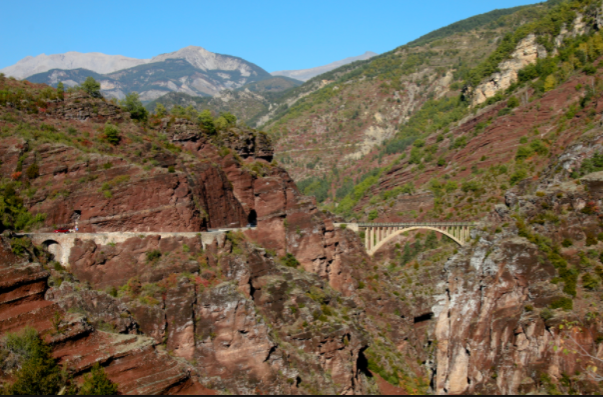 We wanted to visit the Gorge du Cians which lies a bit further along the Route de Grand Alps and is one of the main routes to Nice. However, all the pictures that we'd pulled up on the internet seemed to indicate it was no place to take a big vehicle like ours. Therefore we decided we'd cycle - but that entailed a very long steep drop down off the top of the Col and then another several miles to the start of the Gorge! 'Oh Well' we thought, a good sleep will set us up! Well, the good sleep didn't happen and neither did our bike ride through the Gorge! When we pulled back our blinds this morning our views had vanished completely and T4rdis2 was surrounded in dense fog that just about obscured everything that was more than 10 feet away from us! So we didn't go anywhere in a hurry, but that gave John time to get his maps out and have another look at which direction we should take - and he quickly realised that the pics we'd seen of some of the roads in the Gorge du Cains were of the old roads, and since they'd been taken, new ones and tunnels had been bored through solid rock to make the way much more acceptable! Apparently now the restrictions have been increased to 3.1 metres in height and 2.5 in width - and as we're only 2.8 and 2.2 respectively - we'd have plenty of room 😨 so our trip through the gorge was back on! It's not a laughing matter! And what a trip it was! We left the Aire about 11.30 and by which time the fog was dissipating, then as we dropped down to a lower altitude it soon vanished altogether - but we were still pleased we weren't on our bikes! The hill down to the gorge was one of the steepest we've seen recently - and if we'd cycled free wheeled down we'd have had to peddle bloody hard later in the day! In the end our decision to go in the van proved to be the right one - right from the start the views and vistas that we were treated to were magnificent - and the initial part of the road was excellent. We hadn't gone far into the Gorge when found ourselves parking up so that we could explore the old roads that had been closed off - in one place it had completely fallen away into the river, and we certainly wouldn't have got T4rdis2 under the low overhanging rocks! And even though there was a risk of falling rocks we couldn't resist the temptation of posing for a pic under one of the old arches! 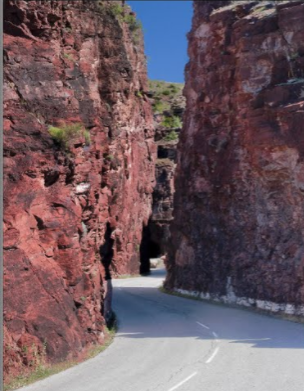 Then, as we drove deeper into the Gorge the road did become narrower and a bit more challenging, but as usual John took it all in his stride, however he did ask if this journey was giving my knuckles a whiter workout than usual! Luckily nobody was coming the other way as we traversed along this balcony road that was only nearly wide enough for 2! But once it did widen out a bit we pounced into a little parking space with a babbling river by it's side and an amphitheatre of tall cliffs all around us - a perfect spot for lunch! 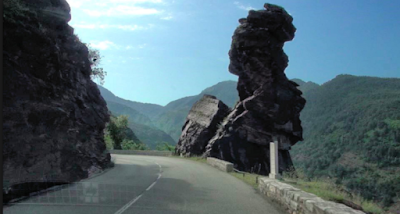 And then all to soon, another adrenaline fuelled trip was over and we were back on a normal road heading over the Col de Toutes Aures and full circle back to the town of Castellane where our Gorge-ous adventure had started a few days ago. But that wasn't the end of today's trip even if we did sleep there! Our target was actually a little Aire near Lac de Thorenc, and to get there we passed along more of Napoleon's Way, and over The Col de Luens - about 25 miles in all - but only to find the Aire had become a wood storage yard with no space left over for us to snuggle in! Then worse still, there were no other Aires or open campsites in the vicinity, and as we were in a National Park, no opportunity for wild camping. Therefore we had no choice other than to retrace our tyre tracks back to Castellane and to sleep in their Aire under the shadow of The Notre Dame du Roc which is just visible from our skylight! Anyway, I think that's about the end of another saga - next stop is the sea side so we'll see you there with our bucket and spade!